The excitement builds as you come into the Fort Lauderdale Cruise Port.. are we there yet??? You turn the corner and gasp in wonder - there she is The Oasis of the Seas! You eagerly take in the grandeur and size of this phenomenal lady. Standing there at the dock looking up at her you shield your eyes from the sun bouncing off her many windows and shiny new paint while watching the frenzied activities of the dock staff loading and unloading cargo. 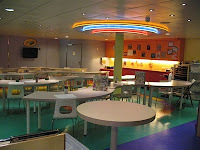 With your Set Sail pass in hand you enter the sleek modern Oasis of the Seas terminal - and make it through security and proceed to the check in section which is convenient, organized and laid out by deck. After the speedy check in in you proceed up the gangway and board the Oasis of the Seas and are welcomed to the Nation of Why Not! 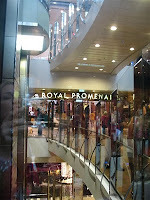 Your eyes are immediately drawn the the Royal Promenade with shops, dining and the amazing Rising Tide Bar. 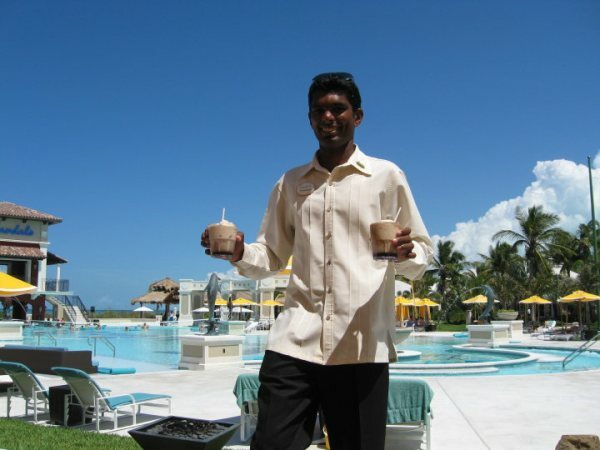 Staff members are there with fresh delicious Pina Colada's to welcome you. You check out the directory screens and the handy deck information by the elevator and hop on your glass enclosed that whisks you away to your cabin. Then after settling in your cabin, whether its a roomy interior cabin or the granddaddy of the them all the Loft Suite you check your planner to do what's going on tonight you could take in Texas Hold em in the Casino, dance to the music in the Viking Club Lounge, see Hairspray, take in a Comedy Show, watch the Oasis of Dreams Aqua show at the Aquatheatre, hit Blaze nightclub with the kids, take in the Ice Show or just sit or relax to the smooth sounds of Jazz at Jazz on 4. 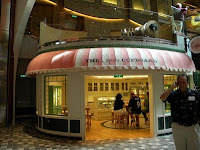 You look over the endless dining options on Oasis of the Seas - 24 dining options with everything from Tapas to Tortillas..heavenly cupcakes and ice cream is waiting for you to taste also. 24 hour room service is available too! If you like me and can't function without your morning coffee.. no worries have it brought to your stateroom and enjoy while getting ready for your day's activities. And activities are abound on the Oasis of the Seas from toddlers to your 95 year old grandmother there is something for everyone... Basketball, The Zipline, strolling in Central Park, take a ride on the Carousel, so many options await you! 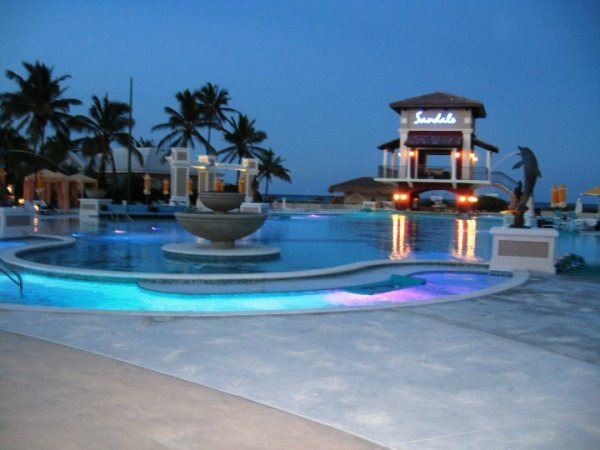 The Pool and Sports Zone is the place to be with 21 pools aboard even one with a sandy shore and saltwater! Fun family dedicated pools geared especially for junior cruisers, these will delight even the most discriminating water bugs. The Solarium offers an Adults only pool for travelers seeking a relaxing quiet area to enjoy the sun. And for those teenagers that are too cool to hang with their parents the Teen Program is chock full of activities all day long and into the late hours of the night and offer The Living Room for some downtime. And don't forget drop the younger children off at the explorers club to enjoy the Science Lab, Crayola, The Library and other great activities and while the kids are being entertained you can enjoy some adult only time in the Solarium pool. 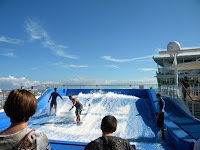 With everything to see and do the Oasis of the Seas is truly a vacation destination... so why not say Let's Go today! Below is a raving testimonial from a satified client. 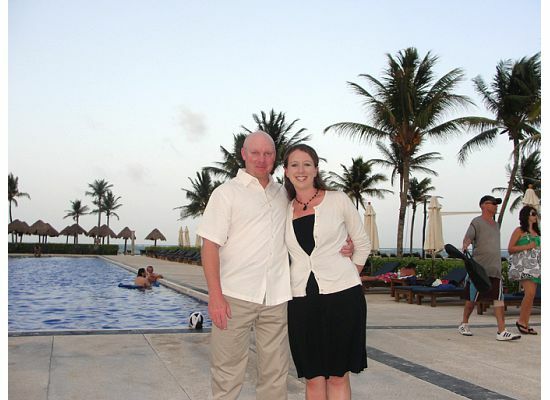 We wanted to share their compliments of not only Shane and A Way To Go Travel, but also of the resort: Dreams Tulum. Just wanted to let you know that we had a great time in Tulum at the Dreams Resort. We will definitely be booking with you again for our next trip and I have a couple of coworkers that I have given your name to because they are interested in Tulum. We really appreciate you taking our budget into account, addressing our concerns, and just taking the time to listen and understand what we were looking for in a vacation spot. It was perfect! Thanks again for everything! 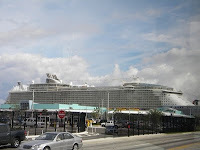 Norwegian Epic is Finally Here! Secure your opportunity to see things only seen on Norwegian Epic, like the exclusive entertainment of the Blue Man Group, two 3-lane bowling alleys, Aqua Park, the amazing new Ice Bar and our two-story Wii™ With over 20 places to eat and the chance to enjoy the largest spa at sea, Norwegian Epic lives up to all the hype! (Western Caribbean) Costa Maya, Roatan & Cozumel. 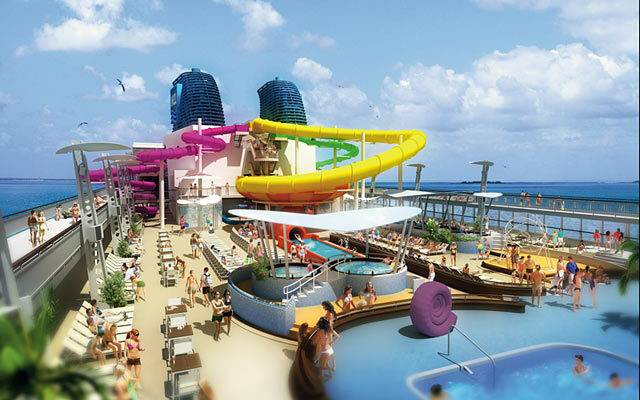 With over 20 places to eat and the chance to enjoy the largest spa at sea, Norwegian Epic lives up to all the hype! 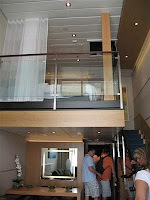 Norwegian's Hello Balcony! sales event is on now. For a limited time, you can receive a FREE upgrade from an Oceanview stateroom to a Balcony stateroom on select 2010 and 2011 sailings! And, if you book a qualifying Balcony stateroom on the new Norwegian Epic you will be automatically upgraded to a Deluxe Balcony - for free. That means you can get a free upgrade* to fresh ocean breezes, dining alfresco and drinks at sunset – all on your own private balcony. 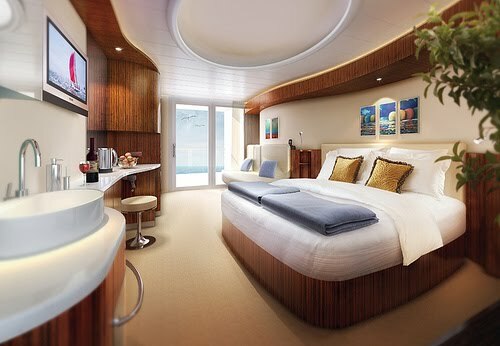 In addition NCL also has bonus offers on all Norwegian Epic bookings. Celebrating Norwegian Epic’s exciting inaugural launch with a fantastic limited-time offer: Through August 1, 2010 (same dates as Hello Balcony) 50% reduced deposit when sailing is outside final payment* AND up to $150 on-board credit* per stateroom! PLUS this offer is combinable with the Hello Balcony! Free Upgrades stated above! Six out of 10 Americans plan to vacation 100 miles or more away from home during 2010, according to newly-released results of a consumer survey commissioned by the U.S. Tour Operators Association (USTOA). Of those, an average 45 percent said they would travel in the shoulder or off season to save money, reflecting the still tentative economy. We found this blog post on ski.com to be interesting and wanted to share it because we have had clients fall prey to such presentations: "Taking the Time Share Walk." Evidently these are popular in many vacation destinations: Hawaii, Mexico and other Caribbean islands. Call your girlfriends . . . we are going to NYC! A Way To Go Travel has partnered with skirt! Magazine in Winston-Salem and we are going to New York City in December. Enjoy a weekend getaway. The windows will be dressed for the holidays. You can shop for that special gift in the City that knows how to shop. Enjoy a Broadway musical. Please visit http://www.journalnow.net/sip_with_skirt/index.php/site/skirtingaround/ for details. 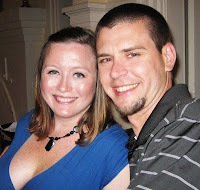 We celebrated our 1 year anniversary at Sandals Emerald Bay, Great Exuma, Bahamas from June 3 - 10, 2010. 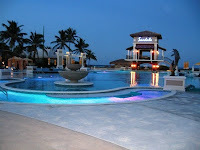 The previous year we were married at Sandals Grande Antigua. 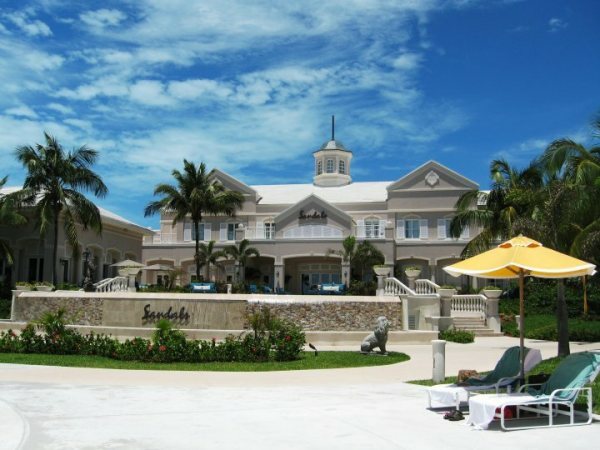 Just when we thought nothing could top our Antigua trip, Sandals Emerald Bay did just that! This resort is a former Four Seasons and has been newly renovated and 'Sandalized' to perfection! From the moment we arrived to the second we left we were truly treated like royalty! 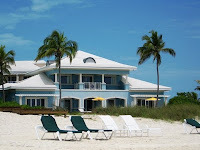 Being an all butler resort your every need and want will definitely be met. The grounds are gorgeous with tropical flowers everywhere. The rooms are spacious and well kept. The food and drinks are plentiful - you certainly won't go hungry! The beach is the best we have ever seen - the water bluer than the sky and the sand as soft as powder. There are NO vendors on the beach which was a nice alternative to many other Caribbean beaches. Most days we were able to relax to the fullest by the pool in a cabana. We would notify our butler that we had reserved a cabana or umbrella and he would proceed to stock it with towels and a cooler full of drinks to our liking. Not once did we have to order our drinks from the pool bar, as our butler was great at anticipating our needs. Before we would even realize we were thirsty he was delivering a frozen concoction to us in our cabana or while we were floating in the pool. AMAZING service!! Our butler also served our lunch in our cabana each day which was so nice to not have to get dressed to go to a restaurant. This resort has 183 rooms and 5 restaurants. 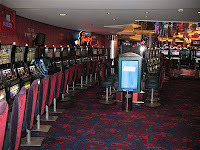 We hear they are planning to add many more rooms and several more restaurants in the coming year. We highly recommend visiting this resort before the new additions are made because as of now it's not overcrowded and it has such an intimate feel. We were told that rates will definitely go up once additional rooms and restaurants are added. We certainly want to return once the renovations have been made to experience the changes and additional upgrades compared to our first visit. There are lots of great excursion that I encourage you to participate in, including free daily snorkeling trips! This was the best snorkeling we have ever done. We were taken to a fairly shallow location that included several large blue holes where the ocean floor would literally be open with millions of fish inside. Some of the blue holes were 30 feet deep - AMAZING!! Another excursion not to miss is the Thunderball Grotto tour. This is a full day tour where you are taken to see the swimming pigs (yes! pigs! ), nurse sharks, giant iguanas, among other exotic sea life. A stop is made on a 2 mile long sand bar in the middle of the ocean with unbelievable views! Lastly, you are taken to the underwater cave, Thunderball Grotto - where a James Bond flick was filmed, among other movies. You can snorkel inside the cave or you might choose to jump through the top of one of the many openings into the 30 feet deep waters which are filled with the most colorful fish you will ever seen. Truly an unforgettable experience! The price of a passport goes up next week. A passport is necessary to enter most foreign countries. It is required for entry into the United States, even if you’re an American citizen. It also serves as proof of U.S. citizenship and identity. The U.S. Passport Book and U.S. Passport Card for adults are valid for 10 years. Passports for minors under age 16 are valid for five years. The cost of a passport book for first-time adult applicants will increase to $135. Renewal will cost $110. The price for minors will be $105. A first-time passport card will cost $55, a renewal will be $30 and a minor’s card will be $40. The fees do not include other charges for additional visa pages, file searches or expediting the application process. A passport card is different from the passport book. The passport card can be used to enter the United States from Canada, Mexico, the Caribbean, and Bermuda at land border crossings or sea ports-of-entry. It cannot be used for international travel by air or to re-enter the United States by air.